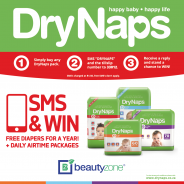 WIN with DryNaps and Shoprite! WIN a DryNaps Pram, Car seat and baby Product hamper! 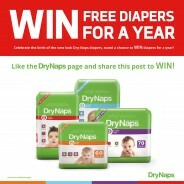 WIN DryNaps diapers for year! A family-owned and run manufacturing and distribution company since its inception in 1974, the Osco Group was founded by Yunus’ Osman, and has come to nurture strong relationships with major retailers across the country. The Group take pride in all products that go out of their doors and have come to occupy a place in the hearts and homes of the nation. As a tissue-based product manufacturer and distributer, Cleopatra is behind many retailers’ favourite disposable hygiene products. With 13 years of expertise and a team of over 100 employees, Cleopatra has come a long way. From baby diapers, to tissue products, wet wipes, adult incontinence and sanitary pads, Cleopatra stand for South African developed made and sold products for the South African market.